Aqualand is a water park in Tenerife located in the Costa Adeje area, near Playa de Las Americas. It has a large selection of slides, tunnels, swimming pools and kids play areas. The park also has a spectacular dolphin show that is included in the ticket price. Flying Boats – Flying Boats is made up of two slides of 272 meters long, spiraling and dropping within each other over four different levels. Twister Racer – Speed ​​and fun for our visitors, 80m long, 14m high and 4 tracks to provide you with the best leisure moments. Try them! Multidsurf – An 16 meter high attraction comprising of six lanes. Lay on one of our mats and race your friends down an exhilarating 100 meter drop. Crazy Race Junior – This beautiful fairy-tale castle hides three slides with soft undulations that will be loved by the smallest once in your family. Forest Land – The branches of this beautiful giant tree convert in to slides. Your children will be transported to a magical forest with dragons included. Family and Cild Wave Pool – The new attraction is here! A themed wave pool taking us back in time. The ambiance is transformed and the tranquility makes way for the emotion of both young and old. Although its meant for the little ones, it´s for mums and dads too. Its heated and the depth descends from 0 to 1.80 metres. It’s safe and controlled by trained personnel at all times. Don’t miss it! Jacuzzi – Relax and unwind in our new spa “heated water 25º”. Take in the sun in one of the 6 hydro massage showers or lay back in our giant Jacuzzi. Stepping in is easy but you might find it difficult to tear yourself away. Lava River – Grab a floating ring and let this lazy river take you on a 500 meter circuit surrounded by vegetation, a waterfall and a volcano whilst you take in the sun. Here you will find the stars of Aqualand. This large group of bottlenose dolphins will astound you with a display that has won them the best show in the world award at IMATA (International Marine Animal Trainers’ Association). Dolphinarium in Aqualand Costa Adeje is fortunate to be highly successful in the reproduction of the bottlenose dolphin in an enclosed environment. Up to date 15 dolphins have been born in our facilities, ensuring the continuity of the Tursiops Truncatus, not just in Aqualand Costa Adeje but also other dolphinariums of the Group Aspro. 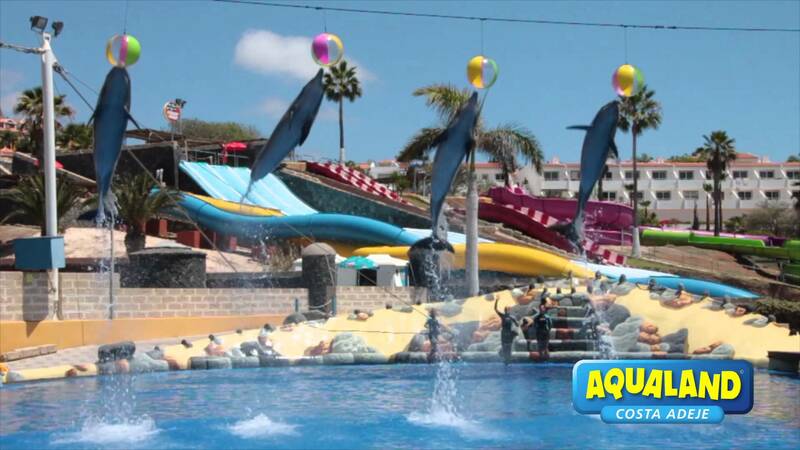 Aqualand Costa Adeje has different interaction programmes with the dolphins focused on visitors. Here you have the chance to get to know them and interact with them. Learn all about how they live, how they relate with each other, what they eat and all the other things you have always wanted to know. Trainers will be there at your disposal to provide all the information you need. Daily & Free Shuttle Bus from Playa de Las Americas and Los Cristianos. South area Bus along the following route (on prior request, €2,50 per person round trip). 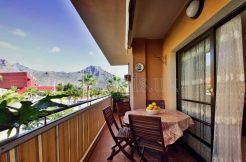 ZONE : Golf del Sur, Tembel, Los Gigantes, Playa Paraiso, Callao Salvaje, La Caleta. Tuesdays and Thursday (Information and booking at the hotel). North area Bus along Puerto de la Cruz and Las Caletillas (on prior request, €8.00 per person round trip). Every Thuesday and Thursday : (Information and booking at the hotel).